Photos from St. Moritz went to Indian and Pakistani media. Shown is Pakistan’s cricket god Shahid Afridi, who was pictured with Indian fans. What’s more, he even asked Indian viewers to put their flag in front of the photo. What’s so special about that? Background: Pakistan and India are mutually hostile to one another. In the colonial era, both countries belonged to British India, before two nations emerged from India and Pakistan with independence from the British Empire in 1947. With the split came the hatred: the two nuclear powers have been at war with each other three times. Since cricket is the number one national sport in both countries, the rivalry always overflows in cricket games. It’s a different story in St. Moritz, where the “Amul St. Moritz Ice Cricket” event took place last week and brought 20 million viewers to TV screens. 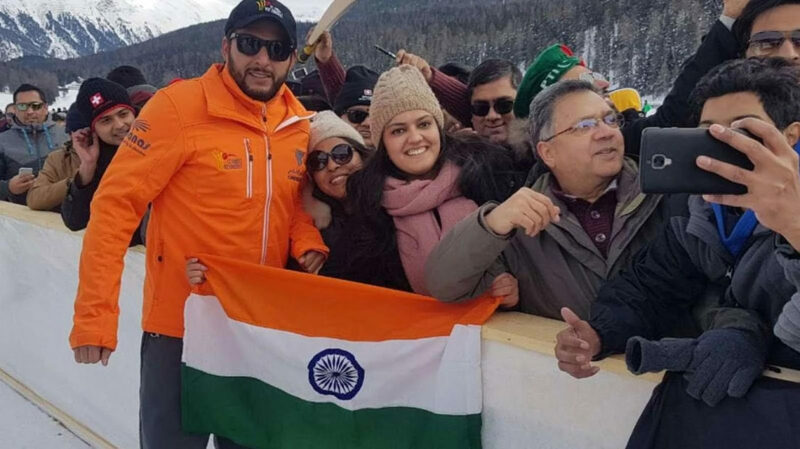 Afridi wants to edge into the picture with the Indian flag and says overwhelmingly.